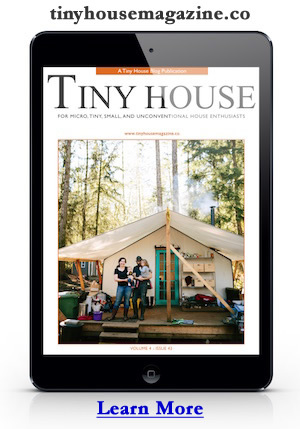 JB, one of my regular readers, recently sent me a link to his tiny house project. He’s building a tiny house in the UK mostly from stuff he finds on freecycle.org. In the end he expects to spend only about £1000 (about $1,400 US) on his tiny house. JB a self confessed tinkerer and from the look of it he’s a very good craftsman too, which makes building a tiny house from scavenged building materials much easier. For example the trailer frame came from an old travel trailer. Instead of using the old rusted frame as is, he spent quite a bit of time bringing it back to life which included cleaning off the rust, repainting the frame, and refurbishing the trailer breaks. Above: Trailer frame before refurbishing. Below: Trailer frame after rust removal, repair, and paint. Once he had his trailer foundation ready to go, out came his carpentry and design-on-the-fly skills. Instead of building from a set of plans JB began knocking lumber together from a design that mostly existed in his head. From the look of it he also has a very good sense for design. You might also notice from the photos that he’s building the house in components that are separate from the trailer. Early on JB realized that the single axle trailer may not be stout enough to haul the wood house down a public road. He also wanted to allow for flexibility and the future possibility of removing the house from the trailer once a permanent site or more suitable trailer could be found. In the mean time the house will live on the light-weight trailer to make it more convenient to move around. Below are examples of the wall components. He also plans to implement a couple of very clever ideas. The first is removable wheel well covers that can be inverted to covering the holes in the floor when the wheels are removed from the trailer. The wheel wells take up floor space so this idea would allow him to recapture valuable square footage. The other novel idea is placing a bath below the ground floor bed. I’m imagining a hinged bed that flips up to reveal the bath. This is a very interesting way of adding more functionality to a small space without having to build another room. After all you can’t sleep in bed and be in the bath at the same time. I’m looking forward to seeing this great out-of-the-box thinking in action. It’s really inspiring to see real innovation in action. JB’s skill-set makes it easier for him to make his tiny house dreams a reality but I think this kind if clever ingenuity is inside each of us. Given the right mix of motivation and inspiration each of us is capable of making our dreams come true. I think this is especially important to remember during hard times. Instead of giving into negative feelings look for a way to make lemonade from lemons. Pull out your ingenuity and create clever solutions. It’s not easy but it is within reach. JB is another example of someone proving that this is true. Be sure to visit JB’s tiny house website. Thanks again JB! I’m looking forward to watching your progress. This entry was posted in Tiny House Projects and tagged jb, jonny barker, tiny house, uk, united kingdom.